Amazing Antique Semi-Lingam Singing/Talking/Fountain Bowl – 2 Perfect Pitch Voices! 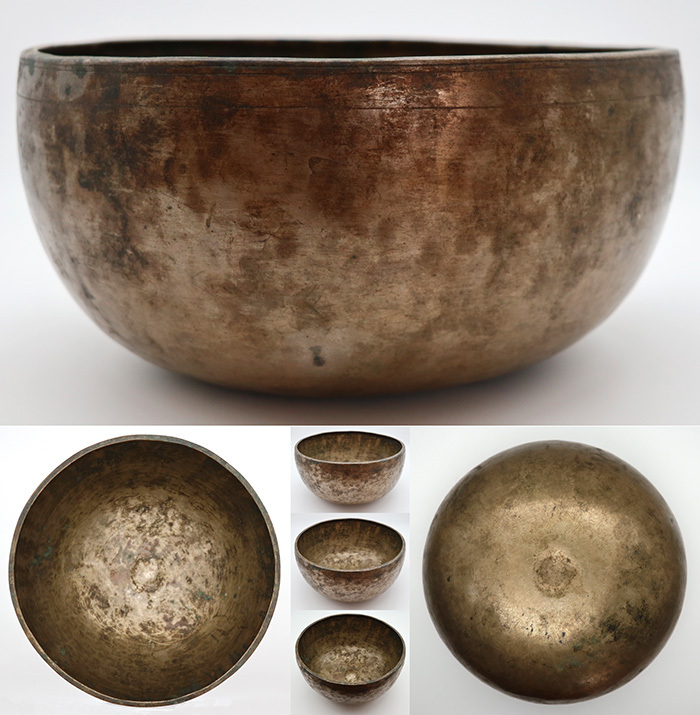 This is a very rare and interesting antique bowl indeed...for its extraordinary form, voice and versatility. The basic shape is that of a medium size Jambati Singing Bowl, but with the addition of a mounded semi-lingam at its centre, with a matching depression underneath. The semi-lingam, combined with a very finely beaten wall, contributes to its versatility as a singing bowl that is capable of producing the strange sounds known in the bowl world as ‘talking’ or howling when played and rocked with a little water inside. It also has lots of vibrant energy and is capable of producing splashy fountains. This bowl also has very interesting sonic properties. The fundamental note is clearly a B...but which B? Struck and played notes range from a perfect pitch low second octave B (123Hz) to a perfect pitch third octave B (247Hz) and even a second octave Bb (119Hz). There is also a middle G harmonic (381Hz-3866Hz). This bowl (circa 1800s) is structurally sound, but supplied in its ‘as found’ condition. I am fairly certain it could be cleaned if desired. A very rare and special antique bowl that will appeal to a wide range of therapists and shamanic practitioners.